Jose Ismael Alfaro Lainez is an 18 year old Salvadorian teenager who came to the U.S in July of last year following his parents and escaping gang violence. Last January, he was picked up by Immigration and Customs Enforcement officials (ICE) in Georgia as part of the nation-wide raids on Central American migrants as he was on his way to his high school. He has been in a detention center since then under the treat of deportation. When Jose was 5 years old, his parents and older brother left El Salvador to come to the U.S to find a better life for their family. He grew up under his grandparents’ care while his parents worked in the U.S. In 2014 Jose became a victim of this violence himself, when a local gang began to force him to join them. When he refused, he began to be harassed, threatened, and persecuted. He finally convinced his parents to let him travel to meet them in the U.S. When he entered the U.S. he was detained and taken to an immigration detention center, but then he was released pending his asylum claim. His mother, who had not seen him in 10 years, was ecstatic to have her youngest son back. He felt good being with his family, and began to go to school, enrolled in 10th grade. He even had a work permit, valid until April 2016. But on the morning of January 27, 2016, as Jose was on his way to school immigration agents were waiting for him behind the stairwell of his apartment. As he exited his house, he was detained, told to go to his apartment to get his documents, and taken to the Irwin Detention Center in Georgia. 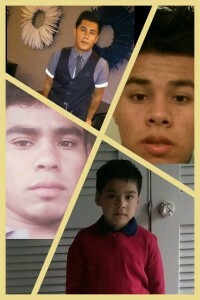 Please join Jose and his family in urging the Georgia ICE Office to us prosecutorial discretion to release Jose so that he can be back with his family and mother, and continue to go to school. Update: Unfortunately we heard this morning that Jose Ismael Alfaro Lainez was deported on April 13, 2016 to El Salvador. Thank you for all of your support. I am writing with great concern regarding the detention and deportation of Mr. Jose Ismael Alfaro Lainez (A 206-794-126). Mr. Lainez is an 18 year old teenager who came to the U.S in July of last year following his parents and escaping gang violence in El Salvador. In January, he was picked up by Immigration and Customs Enforcement officials (ICE) in Georgia as part of the nation-wide raids on Central American migrants as he was on his way to his high school. He has been in a detention center since then under the treat of deportation. I am writing to urge you to use prosecutorial discretion in his case and stop his deportation and release him from detention.